The most effective, safe, and long-lasting UPRT solutions are accomplished through an interrelated combination of industry-approved loss of control academics, proper use of all-attitude piston and jet airplanes, and appropriately integrated flight simulation training devices. Strategic integration of these three training mediums provides an engaging learning environment for pilots to receive the training required to achieve their skill development goals. This powerful approach equips pilots with the skills and knowledge to comprehensively reduce the risk of the Loss of Control In-flight (LOC-I) threat, and make a lasting impact on their overall flying career. 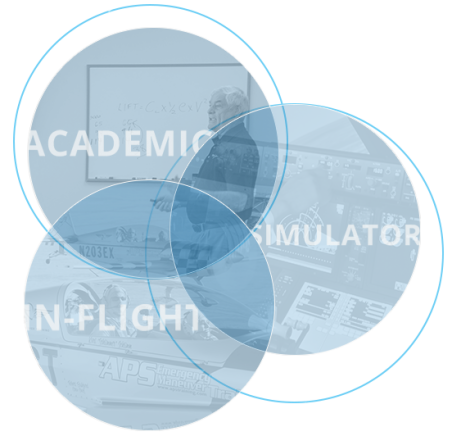 APS’s tri-level structure, painstakingly developed over two decades, consists of structured academics, multiple on-aircraft sessions, and transfer of skill validation integrating flight simulation. In a true synergistic relationship, the whole is greater than the sum of the parts. No single medium or platform provides the comprehensive skill development that integrating all three mediums provides. Any missing element within the integrated training structure causes limitations in pilot skill development, whether those limitations are in knowledge, experience, or skills. All three mediums together provide valuable, complementary lessons for the pilot. APS starts with focused, specialized academics using a variety of instructional venues including multiple online platforms and instructor-led classroom academics. This academic preparation provides the pilot with a focused review of aerodynamics, typical situations that lead to aircraft upsets, and strategies to safely recover the aircraft while remaining within their aircraft’s structural and aerodynamic limits. The syllabus is carefully crafted to be fully compliant with all current industry standards and guidelines related to upset prevention and recovery training. Academics are provided through a building block approach, meaning the information presented academically correlates with the in-flight sessions following a “crawl, before you walk, before you run” methodology. The academics, emphasized through in-flight or in-simulator exercises, help the pilot understand the aerodynamics involved that can lead to an airplane upset event. This building block process provides the pilot with enhanced situational awareness and aeronautical decision-making capabilities to more likely prevent an upset situation from occurring in the first place. By tying academic sessions directly to flight profiles, in-flight training reinforces and enhances the academic concepts. The focus during in-flight training is on establishing reliable and effective core competencies to safely prevent a developing upset event or recover from a developed airplane upset flight condition. These skills are further ingrained through repetition to proficiency. The skills and knowledge introduced during in-flight training are directly transferable to all larger fixed-wing airplanes, including sweptwing transport category jet aircraft. The use of an all-attitude capable aerobatic aircraft allows training to include the psychophysiological aspects, startle and reality factors that are absent from non-aerobatic platforms and flight simulator training. In the final stage, the effective transfer of skills learned in the aerobatic aircraft are validated in other operational aircraft through the use of a flight simulator that is representative of the transport category environment. The flight simulator provides avionics displays, visual fields, flight control pressures, and responsiveness that is more representative of the types of aircraft flown by professional jet pilots. Flight envelope and performance demonstrations along with upset prevention and recovery exercises in the simulator build a pilot’s confidence and proficiency in the application of skills in commercial airplanes.